Attractor could rightfully be called Condenser for how much talent is concentrated into a single show. First we have Lucy Guerin and Gideon Obarzanek. Though partners in everyday life, they don’t collaborate professionally very often—about every six years by their own account. Portland’s seen some good work by Lucy Guerin Inc., and as one of the founders of Chunky Move, Obarzanek has brought some amazing work through town. However, they’ve never been to Portland at the same time. When the directors of White Bird noted this in the Q&A after the performance, they suggested that they might kidnap them and keep them here. 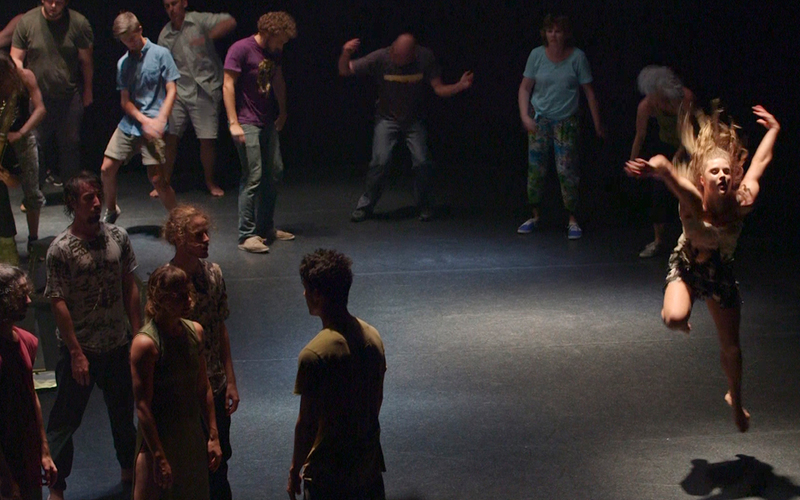 I hope Guerin and Obarzanek didn’t sense how much the audience seemed to support the idea. Any collaboration between these two is worth noting, but joining forces with Dancenorth brings a whole new artistic dimension. Created when Ann Roberts placed $100 on the table during a public meeting because she was tired of seeing talented dancers leave Australia or gravitate to the more populous south to pursue their careers, Dancenorth has become an artistic center in Queensland near the Great Barrier Reef. 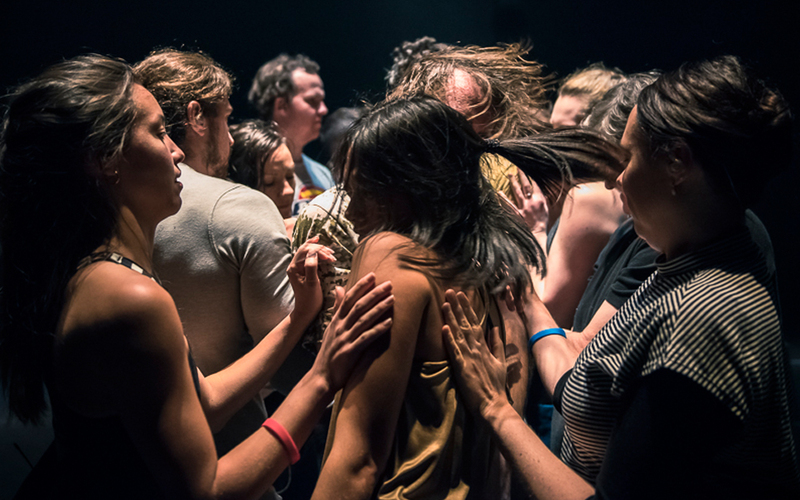 A multifaceted program, the company produces new work, hosts classes, and provides professional development opportunities, putting northern Australia on the map for contemporary dance. They seem to bring with them some of the coastal wildness of their part of the world. Ok, so we have two award-winning choreographers in a rare collaboration and an acclaimed dance company. That’s enough Australian talent to stuff the stage, but those are just the dancers. The musicians knock this one out of the park. Javanese duo Senyawa are not just central to the stage and the performance. Their work was the inspiration for the entire piece, and they were full creative partners in the development of the choreography. As they developed the show, sometimes the music led the movement decisions, and at other times it followed. This exchange is central to the performance itself, and belies an incredibly fruitful collaboration between these talented groups. Senyawa is the experimental musical project of vocalist Rully Shabara and multi-instrumentalist Wukir Suryadi. Drawing on traditional music and folklore from the cultures of the Indonesian archipelago, they combine elements of punk, heavy metal, and avant garde musical performance into an absolutely exhilarating, impossible-to-predict performance that may have no other comparison in contemporary music. Suryadi plays homemade instruments made from bamboo and traditional Indonesian farming implements. In this performance, he mainly plays an amplified, stringed instrument with an incredible ability to jump from musical to jagged, startling sounds and back again while remaining highly listenable and avoiding the wall-of-noise effect that many experimental performances can fall into. Shabara’s vocal performance is reminiscent of throat singing, death metal, and 20th century experimental singers like Meredith Monk or Diamanda Galas. However, these are ultimately useless comparisons, as his performance is really like nothing else I’ve heard. If you caught Tanya Tagaq at TBA this year, that would give you a sense of the visceral, trancelike quality of Shabara’s performance. However, Shabara demonstrates a virtuosic control that lets him move from guttural sound-effects to lyrical singing to piercing screams with precision, giving him a much broader range than Tagaq. Together they wield a crashing, wild soundscape with the combination of freedom and control you see in martial arts masters. Senyawa is making waves in Indonesia and beyond. They’ve collaborated with Melt Banana, Damo Suzuki, and modular synthesizer pioneer Charles Cohen, who produced an album of electronic covers of their songs. I strongly encourage looking them up on YouTube if you’re unfamiliar with them, as a written description doesn’t even scratch the surface. A good start is the short documentary about them, Calling the New Gods, by French documentary filmmaker Vincent Moon. Ok, but what about the dance? What makes this show so remarkable is that all the collaborators manage to harness this wild energy without reducing its power or falling into a maximalist sort of chaos. The show is still very choreographed and very smart. At moments, there were shades Ohad Naharin’s Gaga technique in the way that the freedom of ecstatic dance was worked into the dynamics of a highly trained troupe. The show opens with the dancers seated at stools in a ring around Senyawa. The musicians stand in the center of the circle, behind a waterfall of their music equipment’s cables, strung straight up to the ceiling, like their power was being called down from above. The first clanging sounds from Suryadi’s amplified string instrument animate the dancers, and they follow the music as if they were possessed. Senyawa isn’t directing them so much as they are channeling the energy that animates them, and conducting its distribution and exploration. Most of the movement is as a whole, the entire troupe exploding together, started and stopped by the swerves and shifts in Senyawa’s music. The solos come after this link is well-established, and Samantha Hines drew gasps from the audience when she managed to shake, quiver, and pop-and-lock in perfect unison with Shabara’s growling and vocal acrobatics. Shabara commented in the post-show Q&A that the satisfying challenge of working with contemporary dancers was in working out how to combine the rawness of the traditions they draw on with the critical sensibilities of a form that needs to continue breaking new ground. 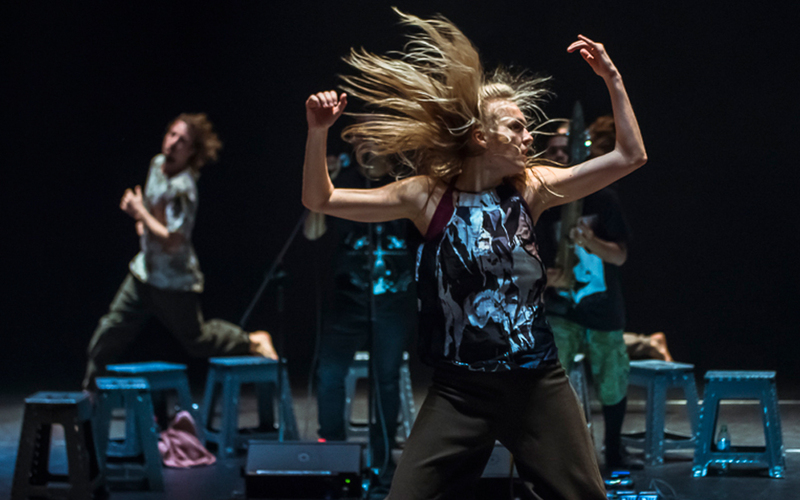 That, I think, is the key to the whole show: The music and the movement create pockets of visceral wildness, but the structure of the show and the contemporary training of the dancers made a home for that energy on the stage where its place and purpose could be considered. True to that purpose, the performance pushed the collective, ecstatic movement out of the stage. The first transgression was the moment a startling rattle filled the auditorium when chosen audience members all shook makeshift shakers on cue. Later, as the dancers were dancing in a circle and clapping to Senyawa’s rhythm, an audience member casually stepped onstage and slipped into the circle and the entrancing rhythm. Then another, and then another, until there were more audience members dancing than professionals. The collective, collaborative nature of the choreography made it possible to continue with this new, inclusive group of dancers for the rest of the show. It wasn’t just a gesture to breaking the fourth wall – it was clear the energy and excitement of all the dancers, professional or not, was real. The power Senyawa was calling down from the ceiling was just electricity, and the ritual was just a dance. And that was obviously magic enough for everyone in the room.